note figures have red fur and cloven hooves along with wings. The overall picture would appear at first to represent angels but then what angels have you ever seen with cloven hooves and red fur. Also very important to note... most depictions of angels include arms and hands. These creatures do not posess arms or hands so we can only conclude that they are some form of lesser angel or more probably devils. here is a link to a US based freemason site.... http://www.grandlodge.org/, which shows the motif on the left! Note also that these creatres in the upper part of the crest are lifting an ark... perhaps the ark of the covenant. This either means they are the gaurdians of the ark or have access to some form of secret knowledge from god. There are words above the ark with make up the flames - and these letters are from the hebrew alaphabet and are a representation of the name of god and the freemasons. 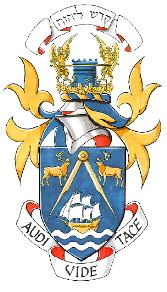 Note also here the demonic or gryphonic figures above the crest of the freemasons of newfoundland. there are too many links to sites speaking up AGAINST the masons... all you need to do is create an adanced search ina search engine which would contain the words "anti freemason" or "anti mason" or "freemason & satan"... and you will get pleanty fo references - ENOUGH READING FOR A YEAR! THIS IS A faq.txt FOR THE FREEMASONS. IT GIVE GOOD INSIGHT INTO THE ARGUMENTS AND COUNTER ARGUMENTS THEY USE. It is also very incicative of the types of quikc fire answers that all freemasons will give. Their training is a form of brainwashing that allows them to come out the marvelous statements like "we are not a secret society... .we are a society of secrets"... and many other gems. Freemasonic will also deny their satanic links wth many colourful prepreapred statements. You start to see through it all very quickly when you realise that every freemason you ever speak to gives you almost word for word repeated statements about how they are a nice loving bunch who wouldn't harm a fly and do so much for charity..... hmmmm. Ever met a freemason. Ever been screwed over by one. Cough cough! LINK HERE TO http://www.tlio.demon.co.uk/index.htm FOR EXCELLENT FREEMASON AND CONSPIRACY INFO BASED IN THE UK!!! ANY OTHER LINKS YOU WANT ME TO PUT HERE???. let me know! Ofcourse the Freemasons run the intelligence services in the UK.... and here is the secret MI5 (MIV) logo which just goes to prove that! A fox getting his own back on a part of elitist society society that brainwashes children into bloodlust sports. Desensitising them to the idea of killing for fun... oops I meant sport.